Please note that this are not genuine fabric colors of any manufactuer. The colors have been hand-chosen by me, as they represent an array of colors which act as a decent, though emphasizing background for my intricate design. I strongly recommend to avoid any bold colored and/or mottled so-called “hand dyed” fabrics. Your months-long work on details and specialitles will be lost in any agitated background. Stitching on an other fabric than white requires changing some yarn color. This will NOT be included in the design chart instructions! 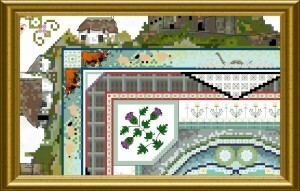 Sprays of Heather embellish the corners, and Thistles and Roses build a delicate border. 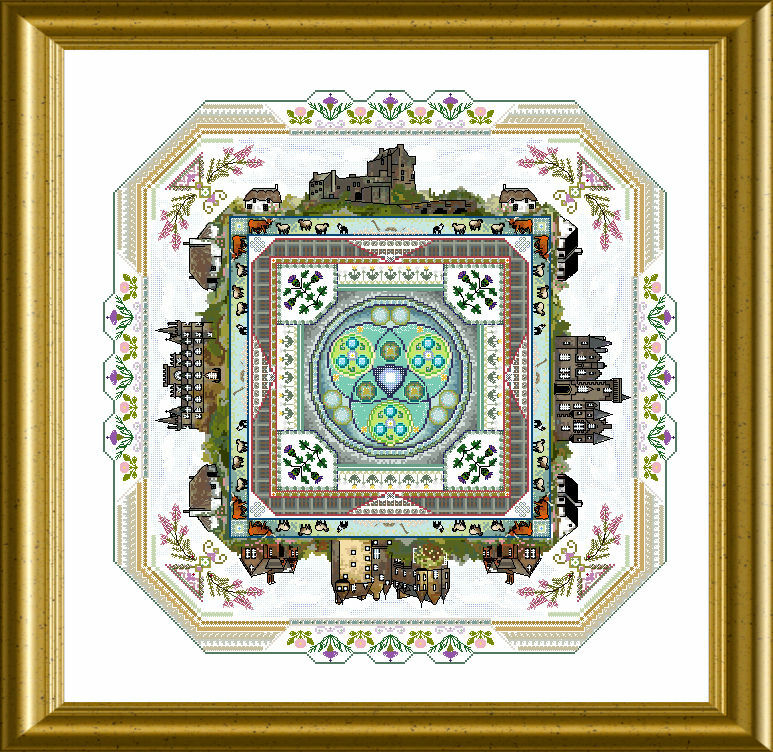 The Hadrians Wall was interpreted by me into rows of Special Stitches „Stones“ which create the delicate and strong diagonal ends of the design. 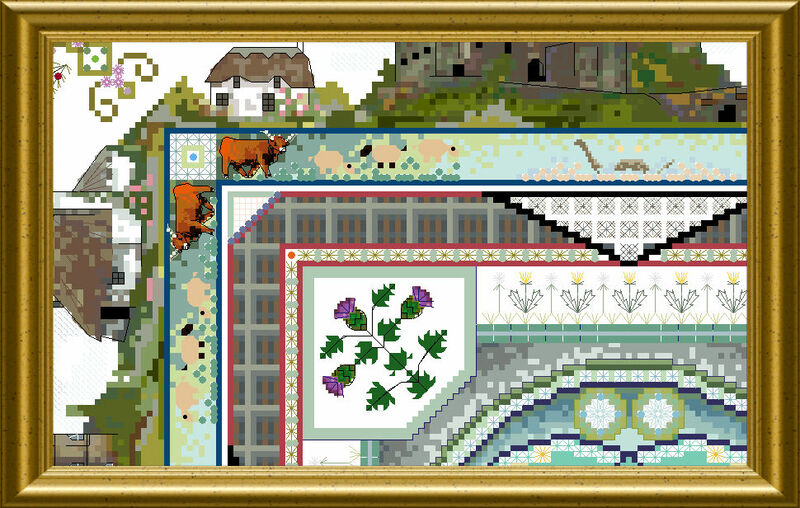 Last but not least an inner border of Tartan chequered fabric gives the very special „taste“ of the Highlands. You will receive an over-one alphabet of antique lettering to insert wording, names, clans, dates…. and personalize your stitched piece to your own taste and heritage ! You will use varied and textured threads, silks, cottons, woolens, hand-dyed and variegated as well as solids – and embellish with beads and Swarovski Crystals. 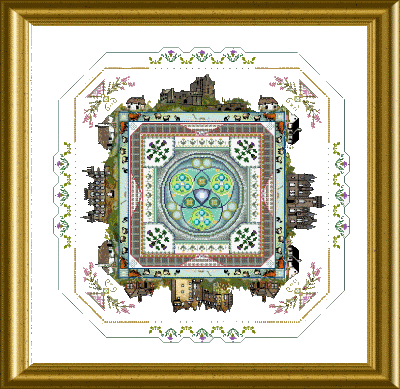 Mere design size is 287 x 287 stitches. 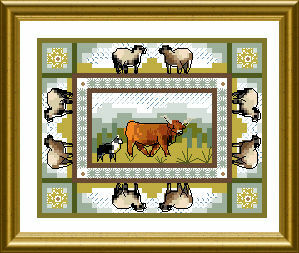 For those who buy this main design (Onl 158) this small goodie will come as a free extra – it is a small design with “over one” cattle and sheep. And a dog, of course ! It is only 46 x 36 stitches in size. Though it is free, it is not a Freebie to share and hand on ! For those who like it but will not do the large main design, it is available as a low-cost small design separately. Looks scrumptious and will be a great piece to do for my Mom. Teri – look ! Thank you 1000 times for the great pictures !! I MUST have this!!! I love the whimsy and I can’t ignore anything that incorporates Hieland coos!!!! Amber, I did not even know that the word “coo” existed, let alone that it was used for this breed of cattle. They look too cute – and their beef is yumm ! absolutely fabulous !!!!! I want I want !!! I oogled over all day. Showed it to my oldest daughter and she’s already claimed it even though I haven’t gotten one stitch done. lol Thank you for another beautiful design, Martina! that is wonderful, Terry – such comments show me that you _see_ what I put into the design. Thank you ! I cannot wait to have this in my possession and start stitching! Incredible. Love it!! One of your most beautiful and detailed designs, Martina. I can’t wait to stitch it. Thank you! This would be a perfect piece for my dear friend who owns several Highland Cattle “coos” – she would love it – as I do !! 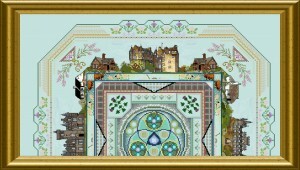 Always wanted to do a Scottish stitchery, the reproduction samplers haven’t called to me but this does! My husband’s paternal grandmother and her family were from Scotland and immigrated to the US in 1905. This is awesome!!! Love all the perfect details! Goodness this is fabulous! Definitely going on my wishlist. My great-grandfather and great-grandmother immigrated from Scotland – They literally met on the boat. I have lovely memories of them from early in my childhood and even more wonderful gems about them from my grandparents and my dad. One of my best memories of great grammy was that she once gave me a beautiful embroidered coin purse (I still have it!) and inside, she placed $10. (A LOT for that time!). I was prancing and showing my papa what Grammy had given me. My great papa looked at the $10 and teasingly said “oh my! That’s way too generous a gift from a Scot!”. We laughed and laughed. As I was leaving, papa asked to see my purse again and gave another $10! I can’t wait to stitch this in loving memory of them! Sharon, what a lovely story !! You must write it down for your children !! If you need help with perhaps personalizing this piece, send me a note ! I will be happy to help to keep up the memories of your grandparents ! I’ve always loved all things Celtic, and part of my family ancestry is Scottish. My parents also spent a year there when they were newly married and my father was a post-doc in St Andrews. I had an older brother who was born there (and died almost immediately). So there’s really only one thing on my bucket list and that’s to go to Scotland and see the memorial where he was buried. Hmmm, i might have to see if I can figure out a way of adding his name and date of birth/death into this. I shall have a think. Hi Kerry, thank you for your kind comment and the shared story – if I can be of help in fitting in wording and dates etc. do not hesitate to contact me. We will find a “place” for sure ! Thank you Martina. So far, I’ve completed the inner circles, so i’ve got a bit of a way to go. 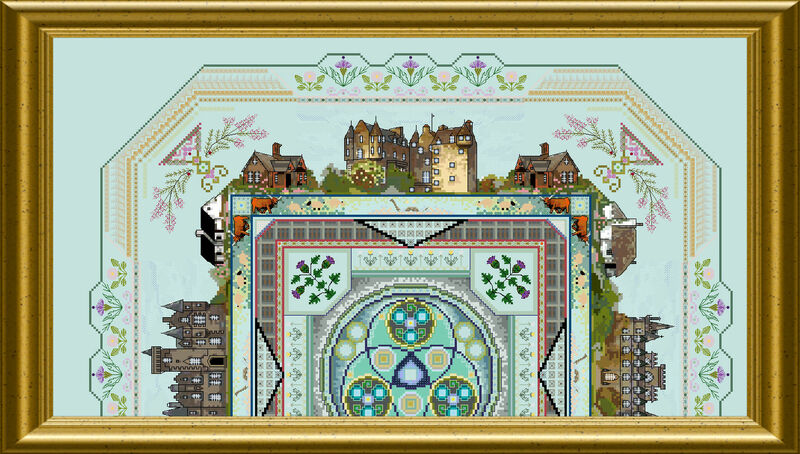 I shall think about it as I stitch, and I may take you up on the offer when I get a bit further along. Thank you again for such a lovely offer.